- Snow beginning this evening with snow levels dropping to lake level tomorrow morning. - Light accumulations below 7000 feet with generally 3- 8 inches above and up to a foot along the highest peaks of the crest. - Snow amounts will drop off south of Tahoe and increase as you head north. 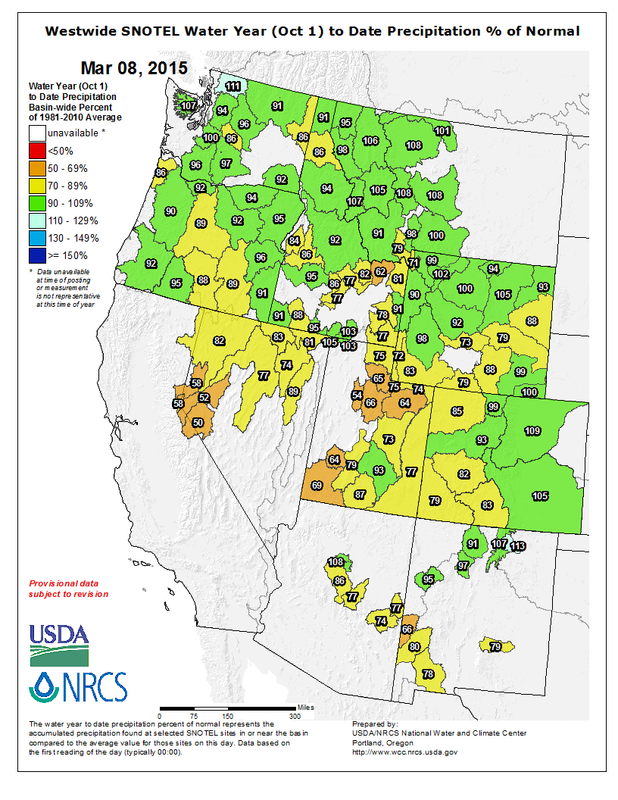 - This storm will do little to save the rapidly disappearing snow pack. Current storm is slowly getting its act together and is spreading some showers into Northern California. Not much in the way of moisture with this storm as there is no significant subtropical tap as can be seen in Figure 1. Figure 1: Forecasted precipitable water (the amount of precipitation that would occur if all of the moisture in the column was wrung out) for this evening at 1700 in centimeters. 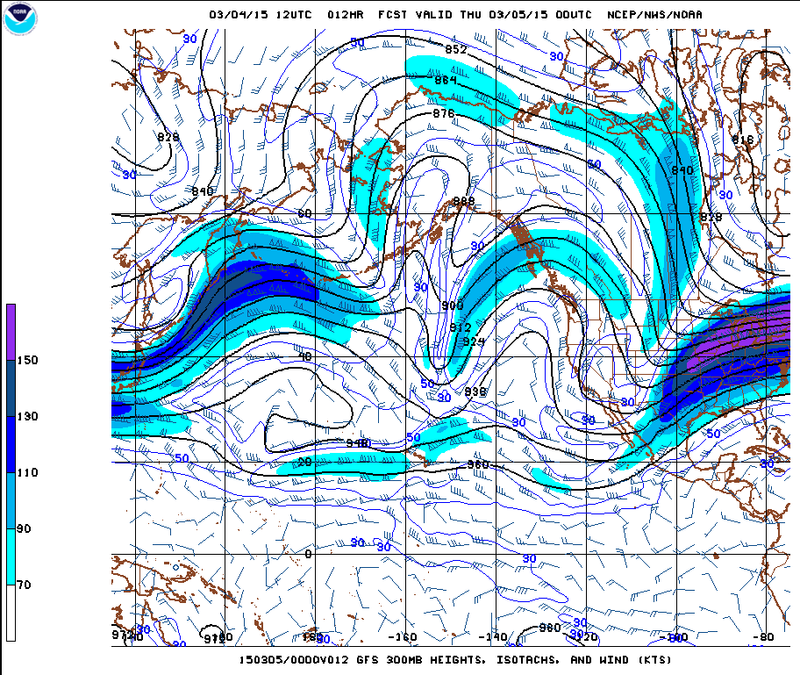 The dynamics are also rather benign with a very weak trough passing to the north of Tahoe along the CA/OR border. However, a respectable shot of cold air (for this season...) will accompany this system (see Figure 2) and allow the snow level to fall to Lake level as 700 mb temps drop to around -6 C.
Figure 2: 700 mb (~10,000 ft) temperature (colored contours) in Celsius and relative humidity (color fill) for 5:00 am tomorrow morning. As can be seen in Figure 2, the bulk of the high humidity air is behind the -5 degrees Celsius contour which for us back to back World War champs is a chilly 23 degrees Fahrenheit. This will allow the majority of the precipitation to fall as snow down to about 7000 feet providing a fresh new coating of white. However, due to the lack of moisture and dynamics, that coating will only be enough to cover small obstacles and fill in some bare spots. 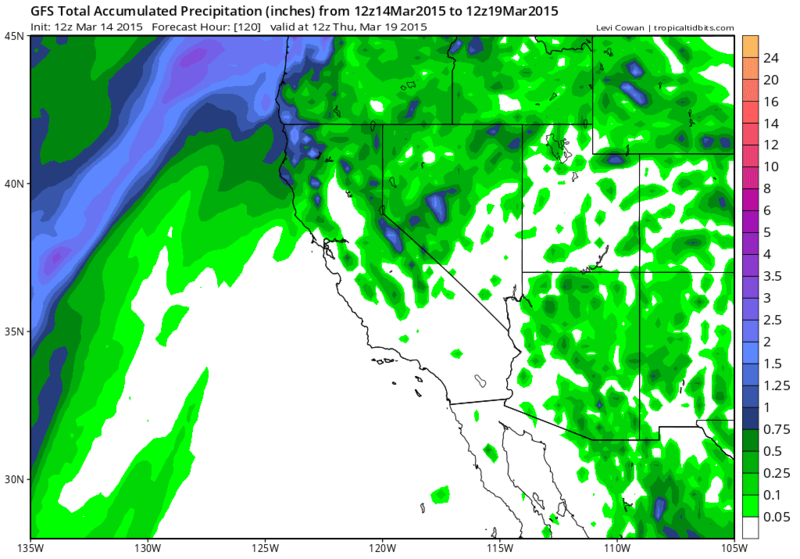 Figure 3 shows the forecasted precipitation amounts from a high resolution model. The crest will be favored with precipitation amounts dropping off as you head south of Lake Tahoe. Meanwhile, high elevations north of Lake Tahoe, like Mt. Shasta, look to do quite well with several feet of snow above 8,000 feet or so. Figure 3: Forecasted accumulated precipitation (in inches) over the next 72 hours. Although this storm will help give everything a fresh coat, it is merely a drop in the bucket as the snow pack is disappearing at an astonishing rate. Figure 4 shows just how early and scary the loss of snow is. 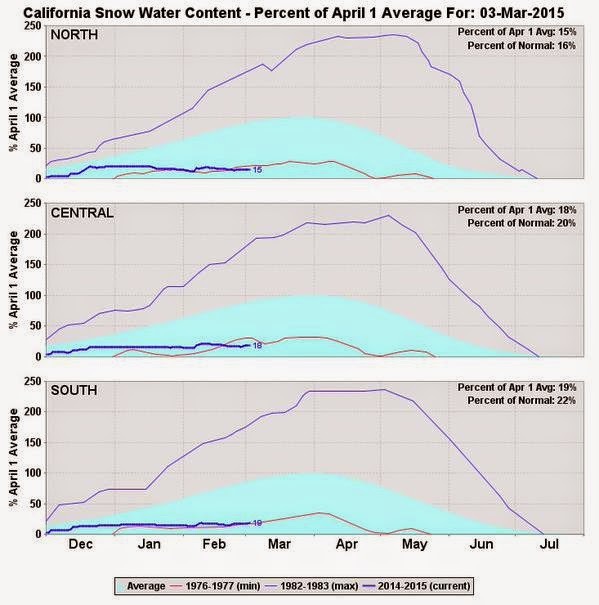 Figure 4: Current snow water equivalent (bold blue line) and total precipitation (bold red line) from the start of the water year for various Snotel sites near Lake Tahoe. 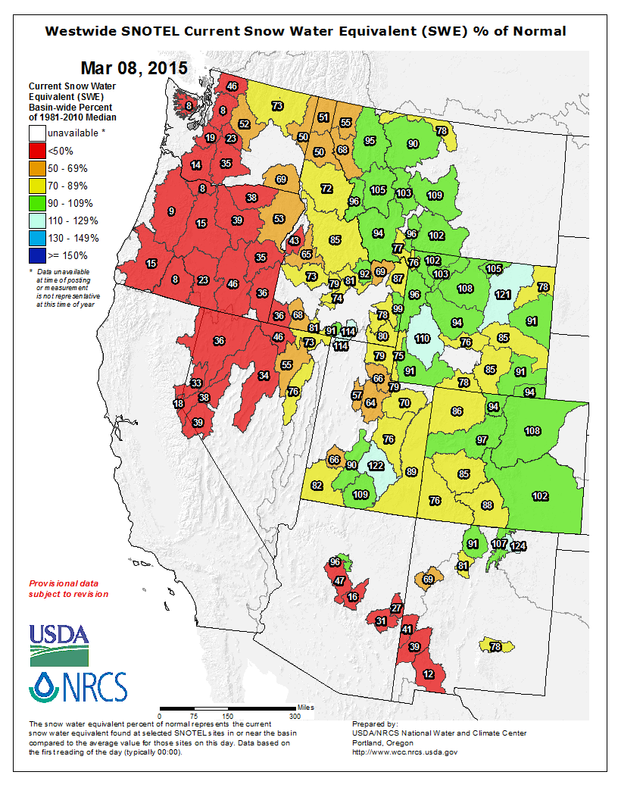 The non-bold red and blue lines are the median (or "normal") precipitation and snow water equivalent. The observations speak for themselves. 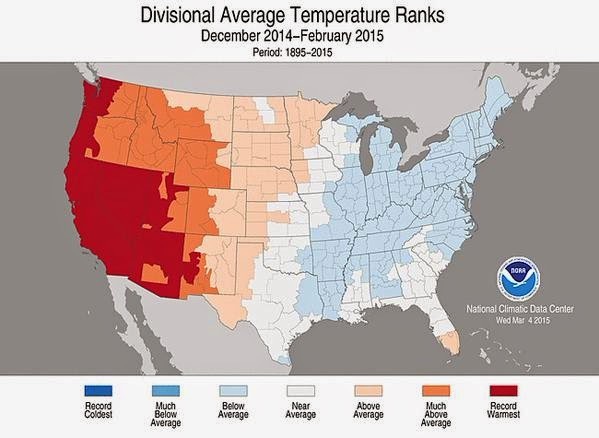 This winter, or lack there of, has been dismal except for at the highest elevations. The "Spring" run off has started as much as two months early and is going to provide little relief to the already depleted water supplies across the region. But to end on a more positive note, get out there and make some turns in the fresh snow before you either have to hike up Shasta or fly south, way south for the Summer.